Are you ordained by an IRS 501c3 recognized ministry? You’re probably here because you Googled, “Is American Marriage Ministries legal?” Let’s get one thing straight – weddings performed by ministers ordained by American Marriage Ministries (AMM) are legally valid in every state in the United States. Period. Out of more than 250,000 weddings officiated by AMM ministers so far, not one single wedding has been annulled to date as a result of the minister’s ordination not being recognized. Let’s address the matter head-on. Getting ordained online with American Marriage Ministries is making a lot of the old guard angry. There are people who have made millions of dollars selling ordinations, and our free online ordinations are making it more difficult for them to take your money. They are behind that anonymous, and misleading website that incorrectly states that weddings “may not be legally valid.” Don’t let them deprive you of this empowering opportunity. But it’s not about them, it’s about YOU, and your right to officiate and celebrate weddings that reflect your values and beliefs! As long as people like you are out there demanding your rights, we’ll be here to serve you. The memorandum cited by the website “americanmarriageministries.com” has since been overturned, and reflects one judges’ opinion, not the policy of the District of Columbia where it was issued. AMM has an established theological doctrine, and weddings performed by American Marriage Ministry ministers in in Washington, D.C. where the memorandum was issued, are valid. The judge actually appears to be siding with states that don’t recognize ministers from other online churches. For example, according to USA TODAY, Tennessee doesn’t recognize marriages performed by Universal Life Church ministers, arguing that getting ordained online through ulc.org is not “a considered, deliberate, and responsible act.” It’s important to remember that states like Tennessee are targeting specific organizations, and not American Marriage Ministries, where our ministers have performed thousands of successful weddings. While some county clerks might ask for additional paperwork, AMM Ministers are legally allowed to perform weddings in Tennessee. How do I know if my online ordination is valid? You want to make sure that you are legally allowed to sign the marriage license, and you want to make sure that your ordination is valid. While most online ordinations are legally valid, there are standards that set organizations apart from others. AMM is a federally recognized 501c(3) charitable organization, which gives it the public legitimacy of IRS recognition. When deciding where to get ordained online to perform a wedding, you should make sure that you chose an organization that is compliant with all local and federal regulations and rules. Is the Universal Life Church a federally recognized 501c(3) charitable organization? The Universal Life Church (Monastery) based out of Seattle is not a federally recognized 501c(3) organization. Other Universal Life Churches have had their 501c(3) status revoked by the IRS in the past. The Universal Life Church (Monastery) has not been approved by the Internal Revenue Service as a tax-exempt, charitable organization with 501c(3) recognition. It’s probably worth investigating who is behind the organization offering you online ordination. Universal Life Church vs. American Marriage Ministries? “Universal Life Church v. Utah, 189 F. Supp. 2d 1302 – Dist. Court, D. Utah 2002”. Google Scholar. 17 January 2002. State of North Carolina v. Lynch (December 1980) State convicts person married by ULC minister of bigamy in second marriage, then overturned on appeal due to the marriage by the ULC minister being found as not a legal marriage. Ranieri v Ranieri Marriage annulled on basis that ULC minister lacked qualifications under New York Statutes: no congregation and not appointed by head of ecclesiastical order. Rubino v City of New York New York City right to deny license to ULC ministers upheld. 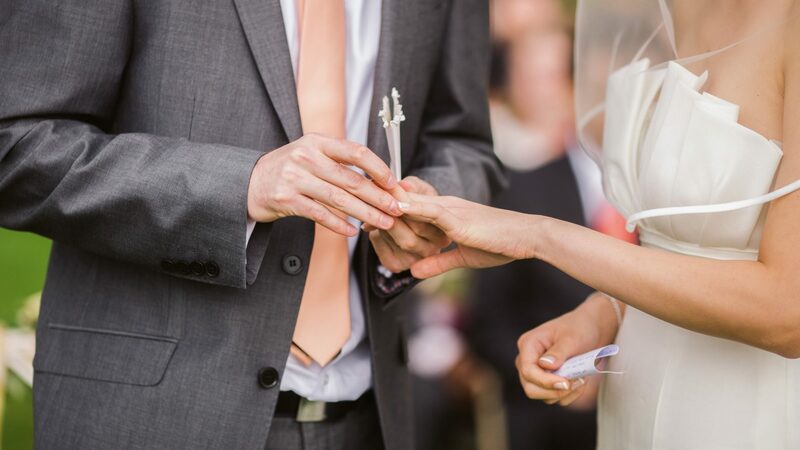 Where can I find the legal requirements for wedding officiants in my state? Please visit American Marriage Ministries’ state minister requirements page to find out what you need to do to perform a wedding ceremony in your state. While some states only require an online ordination, you might need to file paperwork with the local government office. Can ministers ordained online perform wedding ceremonies in my state? You got ordained online, and now you want to know: Is my online ordination legally valid in my state? The answer is Yes, but you should always check with your local county clerk for the most up to date information. While it is your constitutionally protected right to perform weddings anywhere in the US, some states have stricter limitations. In order to make your life easier, American Marriage Ministries has list of state requirements to perform marriage ceremonies in your state. Who is running this website, and what’s your stake in this debate? This website is run by ministers that are affiliated with American Marriage Ministries. It is important to us that the couples we join in marriage are confident that their weddings are legal and valid. With hundreds of thousands of happily married couples, and not one single annulment due to minister’s accreditation, we consider it our duty to stand up to these cheap attacks and to fight for the couples and communities that we serve. If you are wondering whether to get ordained online with another church, make sure to do your research. Check out the links to the court cases above, and do your own research before you click “get ordained” with anyone else!